Patients at the DMC Children’s Hospital of Michigan Specialty Center – Detroit, located on the campus of the Detroit Medical Center, were treated this week to a holiday visit from Actor, Entrepreneur and Atlantic Records Recording Artist T.I., along with Detroit Lions Ndamukong Suh and Radio One 107.5 Personality Big Greg. Hot 107.5 Big Greg, T.I. and Ndamukong Suh. 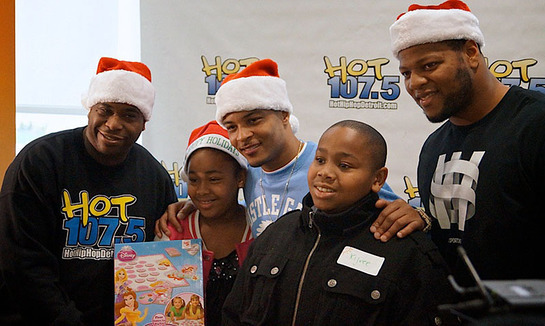 The holiday celebrity visit to the DMC Children’s Hospital of Michigan was coordinated by 107.5 FM as part of Radio One Detroit’s Hot Toy Box initiative to provide toys for the holiday for patients. 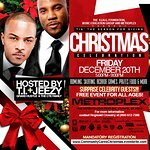 T.I., Suh and Greg brought holiday cheer and distributed toys donated by Radio One loyal listeners. Over one hundred families from the Children’s Hospital of Michigan stood in line to meet the celebrities, get a hug and take photos and every patient left with a toy to help make his or her holiday just a bit brighter. For more than 125 years the Children’s Hospital of Michigan is the first and most experienced hospital in the state dedicated exclusively to the treatment of children. A leader internationally in neurology and neurosurgery, cardiology, oncology, and diagnostic services, it is ranked one of America’s best hospitals for children. More Michigan pediatricians are trained at the Children’s Hospital of Michigan than in any other facility. Children’s Hospital of Michigan is one of eight hospitals operated by the Detroit Medical Center (DMC). The DMC is proud to be the Official Healthcare Services Provider of the Detroit Tigers, Detroit Red Wings and Detroit Pistons.